Bell County is a county located in the U.S. state of Kentucky. As of the 2010 census, the population was 28,691. Its county seat is Pineville. The county was formed August 1, 1867, from parts of Knox and Harlan Counties and augmented from Knox County in 1872. The county is named for Joshua Fry Bell, and was originally called "Josh Bell" but shortened to "Bell" by 1880. Bell County is considered a "Moist" county, a special type of county between dry and wet. The County recently changed to moist by a vote in September, 2015 allowing alcohol-by-the-drink sales in Middlesboro, Kentucky. In a standard dry county, all sales of alcoholic beverages are prohibited. Under ABC terminology, a limited county is an otherwise dry county in which at least one city has approved the sale of alcohol by the drink at restaurants that both seat a state-mandated number of diners and derive no more than 30% of their revenue from alcoholic beverages. In the case of Bell County, Pineville had voted to allow alcohol by the drink in restaurants that seat at least 100 diners. This was the terminology to describe the area until the Middlesboro Vote allowing the retail of alcohol. The Middlesborough, KY Micropolitan Statistical Area includes all of Bell County. The Wilderness Road was constructed in the 1790s through what is now Bell County. Bell County was formed on February 28, 1867, from portions of Harlan and Knox counties. It was named for Joshua Fry Bell, an attorney and member of Congress. The courthouse has been thrice destroyed. In 1914 and 1918 it was destroyed by fire and in 1976 through flood. The documents stored there were destroyed as well. It should be noted that the flood occurred in April 1977 and although it did nearly destroy the county seat, the historical courthouse survived with substantial water damage to the interior. The Community of "South America" (known as Frakes since the 1930s) in Bell County appears to have been established in the Spanish Era. Spain did grant land grants in Old Kentucky prior to English settlement. The Community of South America links southeast Kentucky to an era of Indian herbal harvest and sales much like the Daniel Boone era in the state . According to the U.S. Census Bureau, the county has a total area of 361 square miles (930 km2), of which 359 square miles (930 km2) is land and 2.1 square miles (5.4 km2) (0.6%) is water. As of the census of 2000, there were 30,060 people, 12,004 households, and 8,522 families residing in the county. The population density was 83 per square mile (32 /km2). There were 13,341 housing units at an average density of 37 per square mile (14 /km2). The racial makeup of the county was 96.02% White, 2.40% Black or African American, 0.25% Native American, 0.35% Asian, 0.03% Pacific Islander, 0.12% from other races, and 0.83% from two or more races. 0.65% of the population were Hispanic or Latino of any race. There were 12,004 households out of which 31.90% had children under the age of 18 living with them, 51.00% were married couples living together, 15.70% had a female householder with no husband present, and 29.00% were non-families. 26.80% of all households were made up of individuals and 11.40% had someone living alone who was 65 years of age or older. The average household size was 2.44 and the average family size was 2.95. The age distribution was 24.40% under the age of 18, 9.00% from 18 to 24, 28.70% from 25 to 44, 24.20% from 45 to 64, and 13.70% who were 65 years of age or older. The median age was 37 years. For every 100 females there were 91.60 males. For every 100 females age 18 and over, there were 88.00 males. The median income for a household in the county was $19,057, and the median income for a family was $23,818. Males had a median income of $24,521 versus $19,975 for females. The per capita income for the county was $11,526. About 26.70% of families and 31.10% of the population were below the poverty line, including 42.00% of those under age 18 and 21.80% of those age 65 or over. The largest of the three in enrollment and by far the largest in geographic scope. The district operates six mainstream K–8 "school centers", one alternative school, one high school, and a newly commissioned technology center built to replace the aging vocational center. It is located on the high school campus and the buildings are connected by an elevated, enclosed walkway. The new technology center is also slated to house the County Board of Education pending its move from their traditional office located inside the city of Pineville. Lone Jack High School (in Fourmile) and the old Bell County High School were consolidated into Bell County High School in the early 1980s. The second-largest of the three, with boundaries coinciding exactly with the corporate limits of Middlesboro. The district operates one elementary school, one middle school, and one high school. The two elementary schools are separate facilities that share the same campus design (both schools are designed in an "X" shape), and the middle and high schools are separate facilities on one campus on the west side of town. In recent years Middlesboro Independent Schools has leased the "X" shaped building formerly used as West End Elementary to a local church. The county's smallest district; its boundaries generally, but do not exactly, follow the corporate limits of Pineville. The district operates elementary, middle, and high schools on the same campus. ^ a b "State & County QuickFacts". United States Census Bureau. http://quickfacts.census.gov/qfd/states/21/21013.html. Retrieved March 5, 2014. ^ "Bell County, Kentucky" Genealogy Inc. Retrieved 2010-07-06. ^ Census Office. Tenth Census of the United Status (1880) I:62. ^ Census Office. op. cit. ^ "Kentucky Counties Wet/Dry Status as of 01/30/2013". Kentucky Department of Alcoholic Beverage Control. Archived from the original on July 14, 2014. https://web.archive.org/web/20140714205120/http://abc.ky.gov/Licensing%20Resources/WET-DRY-LIST-04.9.13.pdf. Retrieved July 12, 2014. ^ "Yes wins moist vote - Middlesboro Daily News - middlesborodailynews.com" (in en-US). http://middlesborodailynews.com/news/2948/yes-wins-moist-vote. Retrieved 2015-11-28. ^ Hogan, Roseann Reinemuth (1992). Kentucky Ancestry: A Guide to Genealogical and Historical Research. Ancestry Publishing. pp. 193. https://books.google.com/books?id=hAVlVS29NKIC&lpg=PA193&dq=%22bell%20county%22%201914%201918%201976&pg=PA193#v=onepage&q=%22bell%20county%22%201914%201918%201976&f=false. Retrieved 26 July 2013. ^ Kentucky Transportation Cabinet (1990). 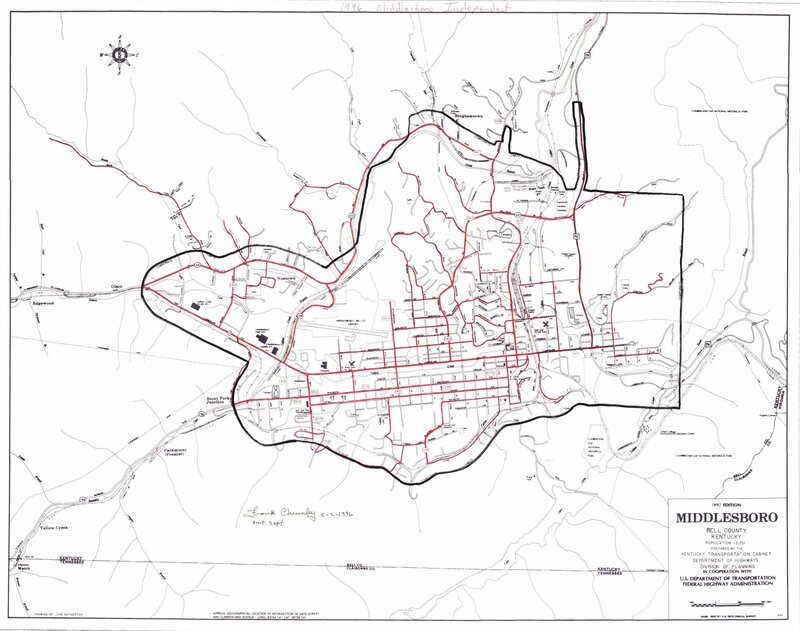 "Map of Middlesboro" (PDF). Kentucky Department of Revenue. Archived from the original on 2008-03-09. https://web.archive.org/web/20080309215012/http://revenue.ky.gov/NR/rdonlyres/6A3088A8-24E9-403C-AE69-0C63EBD8F9FB/0/Bell_Middlesboro_Ind.jpg. Retrieved 2007-10-06. The map also bears a handwritten 1996 label, as the district boundary was signed off by the superintendents of the Bell County and Middlesboro districts. The Middlesboro district boundary is marked in black. ^ Kentucky Transportation Cabinet (1989). 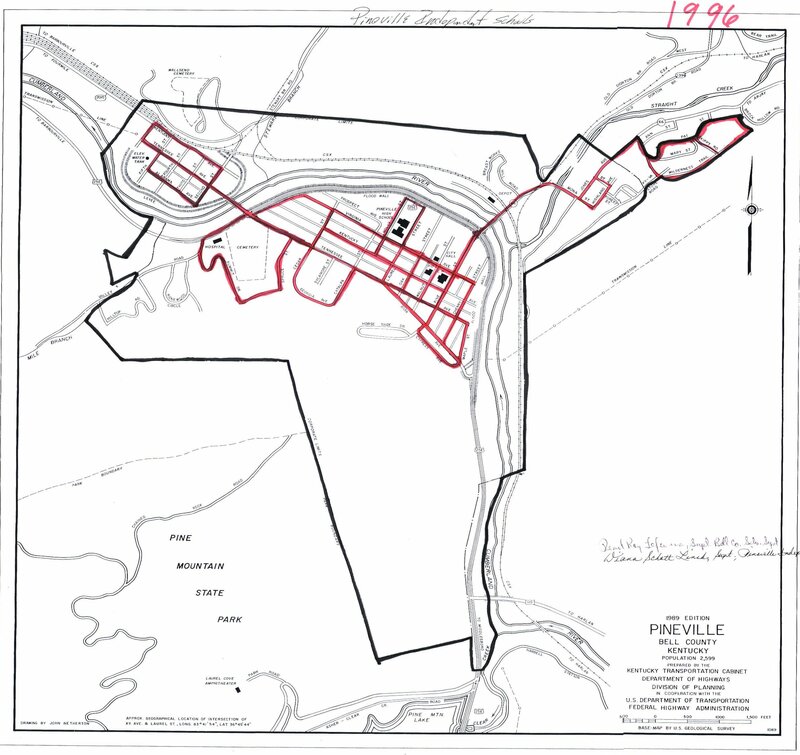 "Map of Pineville" (PDF). Kentucky Department of Revenue. Archived from the original on 2008-03-09. https://web.archive.org/web/20080309215005/http://revenue.ky.gov/NR/rdonlyres/FE1F33F9-A462-4C8C-877F-0FF315522D9A/0/Bell_Pineville_Ind.jpg. Retrieved 2007-10-06. The map also bears a handwritten 1996 label, as the district boundary was signed off by the superintendents of the Bell County and Pineville districts. The Pineville district boundary is marked in black. This page uses content from the English language Wikipedia. The original content was at Bell County, Kentucky. The list of authors can be seen in the page history. As with this Familypedia wiki, the content of Wikipedia is available under the Creative Commons License.